Argentina and Chile have a long history of border disputes at the southern tip of the continent. Both wanted possession of the Straits discovered by Magellan in 1520, but attempts to establish colonies by both countries failed. Chili did establish a colony in 1843. The border with Argentina on Tierra del Fuego was established in 1881. In 1902 through arbitration by Great Britain the part of Patagonia west of the Andes was ceded to Chili. 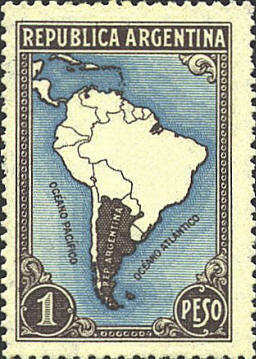 In 1936 Argentina issued a stamp which showed a map of South America with Argentina colored grey. The grey included a portion of Patagonia, claimed by Chile, on the southern coast of South America and all of Tierra del Fuego. 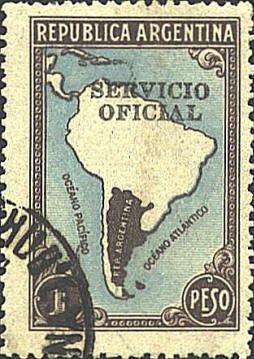 Chili and Peru protested and Argentina withdrew the stamp and issued another in 1937 which removed all national boundaries. Great Britain protested Argentina's claim to the Falkland Islands, but Argentina colored them grey on the new map also. In 1951 Argentina issued a stamp on which the shading again encroached on Chilean territory on the island of Tierra del Fuego, and in Antarctica.